Being Crafty is something other people do. I admire the feats of those who can crochet spectacular Afghan blankets seemingly out of thin air or decorate their homes for the holidays with recycled coat hangers and tuna tins and somehow make them look like a magazine cover. People who have the know-how, skill and patience to embroider babies’ bonnets, build palatial birdhouses out of scavenged fence pickets and carve perfect portraits of great historical figures out of turnips impress me greatly. I, on the other hand, have been known to abandon ship mid-craft, or at the very least change directions radically when I feel I haven’t a hope of getting the hang of what my project was initially intended to be. My youthful embroidery days were ended when I spent a lengthy evening working on the details of some would-be floral tea towel‘s featured bouquet, stood up to gather my sewing and head off to bed, and discovered I’d embroidered through both the tea towel and the lap of my nightgown. My candle-making artistry had only its propensities for melting and burning (and thus, quickly, disappearing) to recommend it. Unlike those who are able to make fabulous sand mandalas with the grains arranged perfectly meditatively into millions of delicate otherworldly patterns would be, if not appalled, then at least mystified and probably saddened, by the strange mud-pies that would be the only produce of my efforts in that direction. Pretty well any craft that takes any real focus and attention, let alone proficient control of the medium, is likely to remain out of my reach. There are, however, certain tools, materials and proficiencies in the land of Craft that I can and do manage. One of the media I have enjoyed manipulating for playful, if not crafty, purposes at times is lightweight spackling compound. This stuff, made initially for repair of wounded wallboard and the filling of trim gaps by builders and handy-persons, resembles cheap bake-shop frosting so strongly in texture (and, I daresay, probably in taste, though that’s moot here) that it goes through an icing bag and tip wonderfully well. 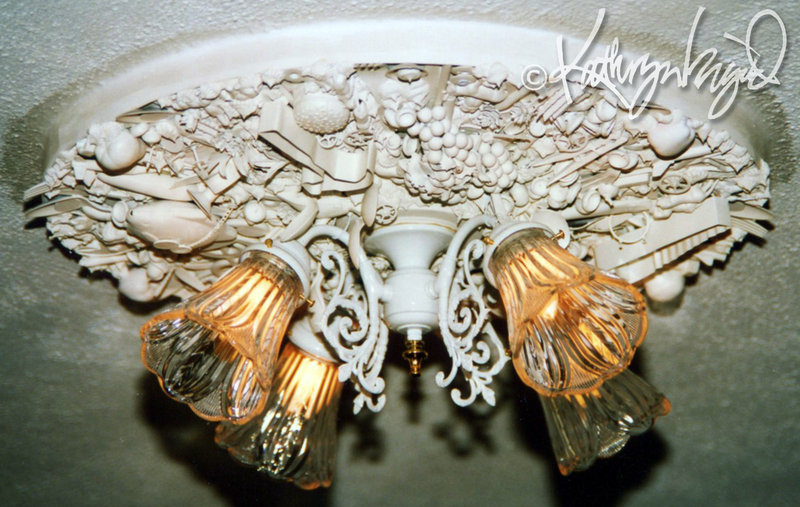 So it’s great for not only creating faux frosty baked goods but also all sorts of the same kind of detail work that plaster and woodcarving and metalworking artisans have used to create architectural accents and furniture details for eons, especially in combination with other small sculptural elements. Thinning the spackle just enough with water to go through a pastry icing tip and retain its proper density and texture and shape while drying is virtually the only difference. In fact, the spackle can be tinted in many of the same ways as frosting, too, though it may be painted and colored in many ways after the fact. In any event, I’ve had fun with this magical past on occasion. I’ve made customized and personalized ceiling medallions with it. I made a nice big window valance that had all kinds of pieces and parts–food and cookery gadgets and the like–blending its own form and meaning with the rest of the dining room in which it hung. I’ve used it to create baroque picture frames and mirror frames. Probably the most fun project with it so far was making a couple of very rococo side chairs by upholstering them with tapestry-like fabrics and then building equally over-the-top sculptural frames and backs out of small objects, some pre-made and some of my own making from plasticine or wood, bone or clay or metal, and then faithfully infilled with spackle ‘frosting’ before I gilded it all with metallic paints. What’s next? Who knows. But there are boxes full of fun waiting for me to make them into something new, and that little yet persistent itch returns from time to time, so undoubtedly there will be a next thing. Just you wait and see. This entry was posted in Art, Education, Humor, Maintenance, Renovation & Remodeling and tagged architectural detail, art, books, building, ceiling medallions, craft, fabric, furnishings, furniture, gilt, light fixture, lightweight spackling compound, media, mirrors, Mixed media, Painting, picture frames, projects, sculpture, small objects, Spackling paste, Supplies, tapestry, uholstery, window valance by kathryningrid. Bookmark the permalink. Fun, fun, fun. I have a cupboard in my office filled with all sorts of crafty things but sadly haven’t made anything for the longest time! You are so clever – wish you lived down the road so I could pop over for a cuppa and lesson or two. You *know* you’re welcome to pop over any time, but I suspect it’d be a ridiculously expensive enterprise, so until then, I’ll enjoy every virtual visit! I know I love seeing how artful and inventive *you* are every time I pop by your place! 😀 xoxo! Trust me, I envy anyone with the skill to even *attempt* an afghan. Each of us has our own gifts, to be sure. I’ll bet you’d have a blast playing with spackle this way, though I suspect it might be wise to wait until you’re out of reach of two little helpers who would probably find it irresistible to eat, since it looks and acts just like frosting, not least of all because I put it through a pastry tube’s icing tips for application. Hmmm, suddenly I’m remembering grade school’s Library Paste, a similarly textured substance I *do* remember some classmates tasting. Not that I don’t get a sudden craving for frosting the minute I see spackle . . . Your handicraft here reminds me of the work of Antoni Gaudí, the Catalan architect, some of whose works I saw when I spent the summer of 1985 in Catalunya (Catalonia). I would love to visit Catalunya myself, not only for a pilgrimage to enjoy Gaudí’s work but also because my editor for these last several years (I proofread English translations for a European choral magazine) lives in Catalunya and I’d love to meet Núria and her family in person one day. Not to mention see the place, eat and drink there, and so much more! I can only imagine that the craftsmen executing Gaudí’s designs must have had *much* more difficult materials in which to work his magic!